One of many ways used by Islamic State in order to provide religious legitimacy to its cause and appeal to the young and impressionable Muslims is by using symbols associated with Islam. Some of the symbols used by Islamic State based on fabricated sources i.e. hadith that can be classified as myth. One example of this is the use of the black flag as the group’s symbol. We have written on this in an article titled The Black Flag Myth: An Analysis from Hadith Studies, published in Counter-Terrorist Trends and Analysis, September 2014 (click here). There are also symbols used by ISIS that are based on authentic hadith. However, its application can still be challenged and contested. The two symbols that fall under this category are Dabiq and A`maq. This article seeks to provide the fallacy behind the use of these two symbols and the narratives that ISIS wants to tell from them. 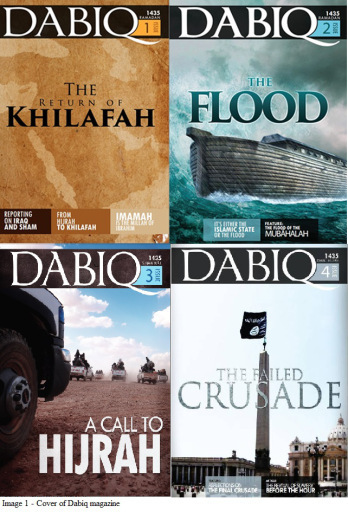 Dabiq (see image 1) is the title of ISIS’ online magazine in English. It contains materials on its ideology, analysis of contemporary issues and news of its activities. A`maq (see image 2) is its media wing. It distributes news and propaganda of ISIS in text and video format via Internet and social media. ISIS adopted both terms from an authentic hadith that contains the Prophet’s prophecy of big battles between the Muslim and Roman army before the End of Time. The use of these names is a clear sign of a legitimacy -creating attempt on the part of ISIS. Etymologically, dabiq in Arabic means glutinous and a`maq means deep holes or low areas. However, many Muslim scholars, when commenting on the hadith, understand them as a special noun referring to a place located in north Syria in Aleppo district, 10 kilometer from Syria-Turkey border. Roman army mentioned in the hadith is not understood as the real army from Rome today. Instead, it refers to an army made up of Christians of Europe origin because Romans during the Prophet’s time represent Christians who were from Europe. This is also the narrative that ISIS seeks to propagate in some videos that it released. The videos challenge western countries (perceived as Christian countries) led by the United States to fight them face to face in Dabiq (Syria). ISIS is the catalyst of the Muslim army that would defeat the Roman army as predicted in the hadith. In other word, ISIS is the party of truth and Muslims are obligated to render support and join their jihad. Unlike the black flag, the content of the above hadith cannot be simply rejected as myth because of its authentic status. However, this does not mean the use of Dabiq and A`maq and the narrative that ISIS seeks to offer through them is not problematic and cannot be challenged. The narrative can be contested on two grounds. Firstly, the ISIS narrative that the current conflict in Iraq and Syria refers to the End of Time event as prophesized in the above and many other hadiths and that they represent the party of truth is, at best, an interpretation on their part and not a divine decree. There is no definitive (qat`ii) scriptural evidence to be relied upon that the current conflict has relation with the End of Time prophecy and the party of truth then is indeed ISIS. Thus, young impressionable Muslims should not be quick to accept the ISIS narrative and should not be afraid to critically challenge or question it. Rejecting the narrative also does not tantamount to rejecting an authentic hadith because what is rejected is not the content of the hadith but its application to the current situation. Secondly, there are many authentic hadiths which also prophesize the emergence of deviant and heretical group from the east of the Arabia and Iraq as some of the signs of the End of Time. Hadith on the emergence of afflictions from Iraq are also reported by Al-Tabarani in his book Al-Awsat and by Abu Nu`aim and Ibn `Asakir who narrated it with chain of narrator that qualifies Al-Bukhari and Muslim requirement of accepted hadith. There are also hadiths that mention Najd, an area now located in Saudi Arabia, as the location from where the afflictions and the horn of Satan would emerge. However, hadith scholars do not see any contradiction between hadiths that refer the east to Iraq and Najd because both are located in the eastern side of the Arabian peninsula and Najd, during that time, was not exclusively referring to the current Najd in Saudi Arabia. It was also understood to refer to hinterland on Iraq. Classical scholars in the past had referred to the groups mentioned in these hadiths to be the Kharijites (Khawarij), Qarmatians (Qaramitah), Mongols and other groups which were the reasons for the many afflictions which occurred in Iraq that caused great tragedy to Islam. But, this does not mean that the temporal meaning of the hadiths stopped there and they are of no relevance anymore today. Thus, it is not impossible that the hadiths could be referring to ISIS which as a matter of fact, emerged from Iraq and has been denounced by hundreds of Muslim scholars around the world with sound and detailed arguments as a heretical and deviant group. Here, ISIS has to explain and answer why the hadiths on the emergence of afflictions and a movement that represents the horn of Satan mentioned above do not refer to them and that that their Dabiq narrative is not a selective and manipulative use of Islamic theological authorities to gain legitimacy and support from ignorant Muslims. Muslims must understand that symbols and narratives that are obscure and subjective cannot legitimise ideas and behaviors that contradict clear injunction of the shari`ah such as terrorism, religious persecution and violent sectarianism. What more if large number of Muslims has agreed upon the issue such as ISIS’ deviation. (Note: We would like to thank bro. Hafiz Kusairi for his technical assistance when writing this article. *Muhammad Haniff Hassan is Research Fellow and Mustazah Bahari is Associate Research Fellow at S. Rajaratnam School of International Studies, Nanyang Technological University, Singapore. Narrated by Muslim, Sahih Muslim, hadith no. 2897. Al-Nawawi, Sharh Sahih Muslim, Bayt Al-Afkar al-Dawliyah, Riyadh, 2000, p.1679. Narrated by Muslim, Sahih Muslim, hadith no. 2905. Narrated by Al-Bukhari, Sahih Al-Bukhari, hadith no. 6934. Narrated by Al-Bukhari, ibid, hadith no. 7094. Narrated by Al-Tabarani, Al-Mu`jam Al-Kabir, Matba`at Al-Ummah, Baghdad, vol. 12, n. d., p. 348, hadith no. 13422. The chain of the narrators (sanad) is good. Al-Tabarani, Al-Mu`jam Al-Awsat, Maktabat Al-Ma`arif , Riyadh, 1985, vol. 4, p.245-246. Abu Nu`aim, Hilyat Al-Awliya’ Wa Tabaqat Al-Asfiya’, Dar Al-Fikr, Lebanon, vol. 6, n. d., p. 133. Ibn `Asakir, Tarikh Madinat Dimashq, Dar Al-Fikr, Lebanon, 995, vol. 1, p. 130-131. Al-Khattabi, I`lam Al-Sunan, Al-Tab`ah Al-Maghrabiah, n. p., vol. 2, p. 1274; Al-`Aini, `Umdat Al-Qari’, Dar Al-Kutub Al-`Ilmiyah , Beirut, 2001, vol. 24, p. 200; Ibn Hajr, Fath Al-Bari’, Dar Al-Rayyan, Cairo, 1986, vol. 13, p. 51; Al-Karmani, Sharh Sahih Al-Bukhari, Dar Ihya’ Al-Turath Al-`Arabi, Beirut,1981 vol. 24, p. 168; Ibn Taimiyah, Majmu` Fatawa, Al-Riasah Al-`Ammah Li Shu’un Al-Haramain Al-Sharifain, Medina, vol. 13, p. 47; Al-Qastalani, Irshad Al-Sari, Matba`at Al-Kubra Al-Amiriyah, Cairo, 1905, vol. 10, p. 188. The first Kharijites were those who opposed the caliphate of `Ali (third caliph after the Prophet) and Muawiyah (founder of Umayyad caliphate after the death of `Ali). Originally, they were supporters of `Ali against Muawiyah. They defected from `Ali because they ruled `Ali’s acceptance of mediation as a means to resolve the ongoing conflict between himself and Muawiyah as contravening the shari`ah. They regarded it (Ali’s decision to mediate) as ruling by other than the Quran and, thus, ruled both `Ali and Muawiyah as apostates. Today, the term is often used for takfiri groups and violent Muslim militant group which sought to bring down Muslim rulers via violent jihad such as Al-Qaeda. See Annie C. Higgins, “Kharijite”, Encyclopedia of Islam and the Muslim World, Richard C. Martin (ed. ), Thomson-Gale, New York, vol. 1, p. 390. Qarmatian was a sect that emerged from the Shiite Ismaili tradition. They were famous for their rebellion against the Abbasid caliphate in 899CE. Their famous exploits included the raid and murder of pilgrims on the way to or from the Haj, the sacking of Mecca and the desecration of Kaabah where even the sacred Black Stone (Al-Hajr Al-Aswad) was taken from its place to their capital. Notorious for their brutality, the period which saw the proliferation of their rebellious acts was regarded as century of terrorism. See John Esposito, The Oxford Dictionary of Islam, Oxford University Press, Oxford, 2003, p. 253 and Mohanned Rahman, The Qarmatians: The world first communistic society, http://www.worldbulletin.net/haber/127416/the-qarmatians-the-worlds-first-enduring-communistic-society (11 December 2014). This refers to the Mongol invasion that caused the downfall of Abbasid caliphate and its brutal aftermath. It is still regarded by Muslim scholars as one the greatest tragedies and darkest period in Islamic history. See one example Open Letter to Al-Baghdadi, at www.lettertobaghdadi.com (11 Decmber 2014).